For those first learning to navigate the Veterans Affair system, it’s not uncommon to feel overwhelmed and confused by the variety of forms of compensation that are available to you. 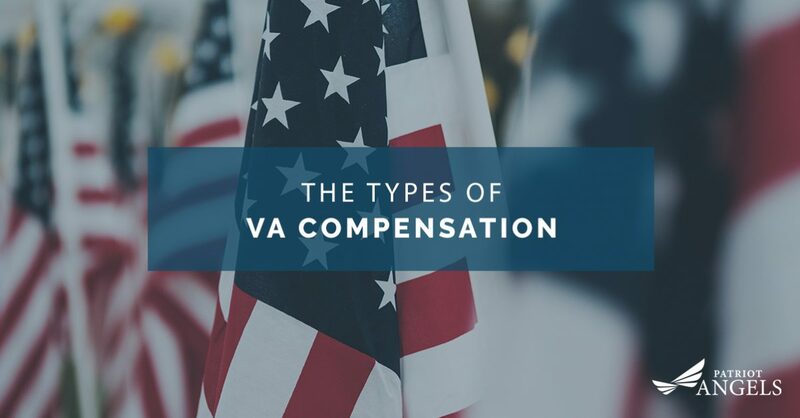 The VA has created a system with many different types of compensation to better provide benefits to veterans, but unless you know what kind of compensation to pursue, you might not get the right benefits for your case. Patriot Angels hopes to make these types of VA compensation more clear. VA disability compensation benefits are provided monthly to veterans with a recognized disability, disease, or injury that was inflicted or made worse by military service. Some of these compensation benefits can be claimed by surviving spouses and dependent children. The disability compensation is designed to offset for the loss of work time that can occur after an injury or disease has been sustained or aggravated during military service. Disability compensation is based on the degree of disability and is graded on a scale from 10 to 100 percent in 10 percent increments. Disability compensation is received monthly and is completely tax-free. In some cases, compensation for other related disabilities or injuries may be distributed, even if these injuries appear after the veteran has left the service. Dependency and indemnity compensation, or DIC, is paid to surviving spouses, children, or parents of veterans who died while actively serving in the military, be it in training or combat, or veterans who died as a result of their disabilities. Typically, parents can only collect DIC benefits if they were financially dependant on the veteran or servicemember who has passed from service-related injuries or causes. This is a tax-free benefit that is paid monthly to a veteran and their beneficiaries in addition to the compensation they may already receive. The SMC is typically a higher rate of compensation that is paid to a veteran because of circumstances that necessitate additional funds or care. This could be something like aid and attendance for aging or severely ill veterans, or veterans who have lost the use of a limb. This is often referred to as Aid and Attendance because it is received based on the veteran’s need for help from another person. If a veteran has been determined to be eligible for compensation for a service-related disability, they may be entitled to additional compensation programs. These programs may provide an automobile allowance, a clothing allowance, hospitalization, convalescence, and more. Don’t let the complicated nature of the VA system dissuade you from claiming your VA compensation benefits. If you or a loved one is in need of long-term care, contact Patriot Angels to get the help you need to claim your Aid and Attendance pension. We are experts in the claims process and can help you navigate the Aid and Attendance qualifications to receive the financial and medical assistance you need. Contact us today to learn more.